Summer is here and for many Canadian families that means taking part in activities in, on, and around the water. Tragically, approximately 500 Canadians drown each year and lack of child supervision is one of the major risk factors that lead to drownings. Drowning is the second leading cause of preventable death for children. Children under five are at particular risk for drowning as they are attracted to the water but can’t understand the danger. They can slip silently under water in a matter of moments and many times in only a few centimetres of water. To get people’s attention and spark conversation, Preventable and Canadian Red Cross have partnered to place beach towels at local pools and beaches with the message: Before you think children don’t need supervision in, on, or around water, have a word with yourself. 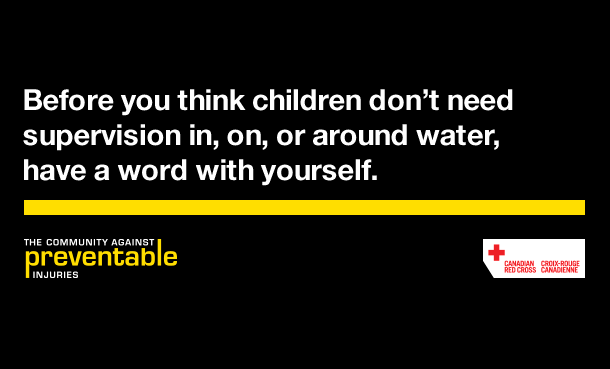 We hope our message will be a striking reminder to parents and caretakers to keep an active eye on their children when around the water because drowning can happen in an instant. Actively supervise children: stay close, keep children in sight, and listen. Ensure pools have adequate barriers around them such as four-sided fencing with self-closing, self-latching gate. Make sure young children and weak swimmers wear a personal flotation device (pfd) or lifejacket. Teach children how to swim. While it doesn’t replace adult supervision, lessons allow children to gain confidence, learn swimming strokes, and water safety skills. Prepare yourself in the event of an emergency by learning water safety skills, CPR and first aid.